Based close to Fleetwood and Glasson Docks, along with several sailing clubs and canal boat marinas, Apex Scaffolding have erected scaffolding for a number of shipyard, boatyard and marine projects. From simple scaffolding for a small powerboat or canal barge refurbishment to large temporary roof structures covering the construction of larger vessels, we can provide the necessary access solutions for your workforce. Virtual Warehouse / Building - Built to house a large sailing yacht during construction, a temporary roof and sheeting over scaffolding was used to create a weatherproof indoor work area. Ships Hull Scaffolding - Scaffolding erected to allow for the painting of fishing trawlers in dry dock. Port and Quayside Maintenance - Various works including scaffolding erected on a floating pontoon. 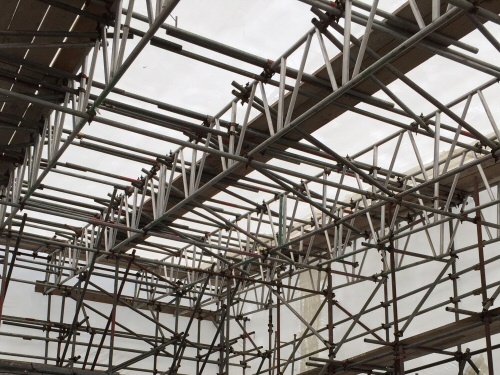 To enquire about our shipyard and marine scaffolding, please email or give us a call.